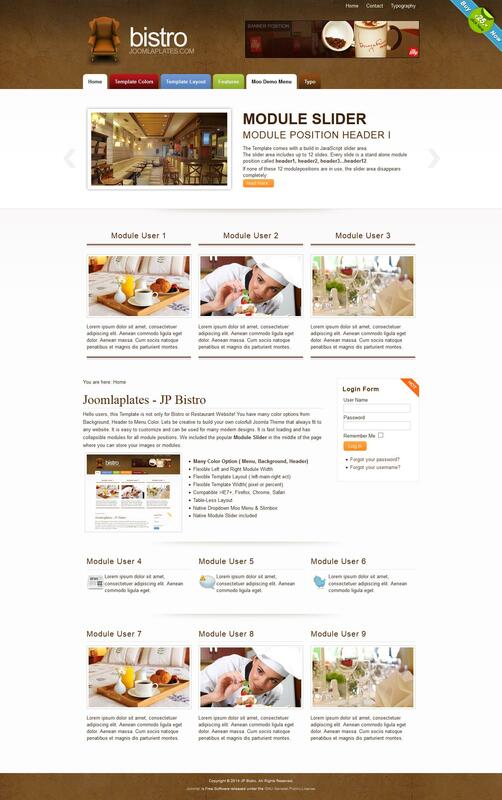 JP Bistro - a great template Joomla, culinary themes represented developers Joomlaplates. It is suitable for creating websites designed for restaurants, cafes and eateries. Its settings allow to determine the necessary colors for the layout. Is produced using the tools manager template. There is a possibility of change in the pattern background color menu and its options. For convenient display images, the developers added rotator Module Slider. It is capable displays all the content on your web pages in a convenient way. This template has a high rate of loading pages. Also he owns foldable modular design that is 25 positions.